Earlier this year, I put together a list of movies that were coming out in 2013 that had some sort of relation to comic-books and graphic novels. Since that time, two of the movies have been postponed indefinitely but thankfully, even without any marketing to this point, R.I.P.D. has remained on the release schedule for a summer 2013 release on July 19. This will put it in direct competition with RED 2 releasing on the same day, PACIFIC RIM releasing the week prior and THE WOLVERINE releasing the following week. Oh boy, oh boy, R.I.P.D., you better start showing us something special really quickly and let’s face it, this first poster isn’t it. 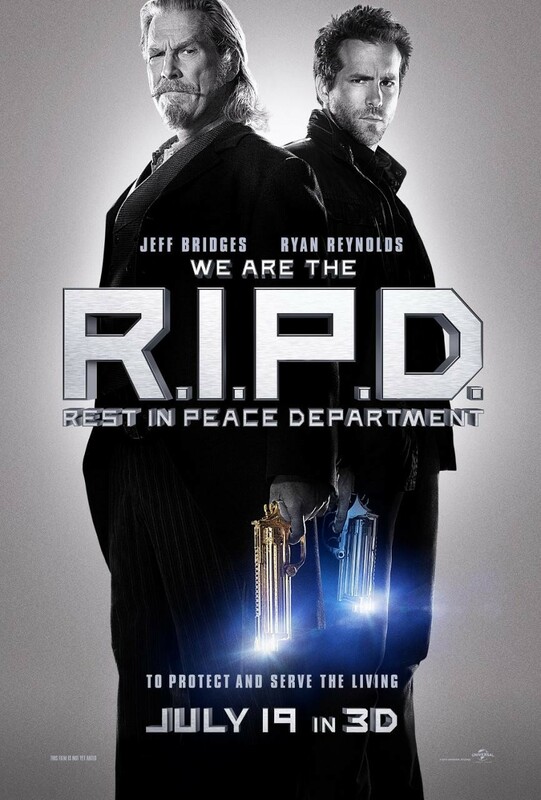 Either way, we not present you the first poster for R.I.P.D. I know, I know, this isn’t the most original or exciting poster ever created for a movie and I know it is only a teaser poster and yes, I am getting a MEN IN BLACK vibe from it too, but seriously, there is just over 3 months till this thing is set to hit….. I said before that I was interested in this movie based off of the concept alone. Add in Jeff Bridges, Ryan Reynolds and Kevin Bacon and I am really intrigued. Follow all that up with a tweet from Peter Sciretta over at /Film and now I am hoping beyond hope that this film delivers and doesn’t get lost in the shuffle. Ok, so we know the poster is nothing terribly exciting, but let us know what you think anyway in the comments below. R.I.P.D. is directed by Robert Schwentke and stars Ryan Reynolds, Jeff Bridges, Kevin Bacon, Stephanie Szostak, Mary-Louise Parker, Marisa Miller, Mike O’Malley, James Hong and Robert Knepper .